Fugro testing with Edge Tech system has targeted detecting 2m diameter objects at 1000m distance on flat sea bed. Unclear how well defined an image of such an object would be. ProSas system on GO Phoenix vessel is expected to have rather higher resolution than the Edge Tech system. Note when comparing listed resolutions of these towfish in published documents that resolution in direction perpendicular to travel (often quoted) will usually be substantially lower than that along the vessel track. Would be nice if there is a method to get all paths and altitudes in one map. I have to do the same for Perth early morning 8th. Why? It is a coincidence, on the FTP site there’s other data missing too. That site is not meant as operational or for use in research – it’s a nice visualisation for the public, nothing more. The original data (used to make those images) is available from both the SSEC and Japanese Space Agency. Also, the images on that site are from 00:00z, so are of no use anyway. Unfortunately you have written too much for me to respond in detail to everything. I’ll take the most important things. There was no cloud in the VIIRS images and thus no possibility for distrails. For the GOMS images there’s no way to tell unless the altitude of MH370 is known. If it were at a typical cruising altitude then long distrails were not possible, no. No, even if distrails were possible then you would still expect to see something in the I5 channel of VIIRS. That was not my intention, I siply wrote what I thought was relevant. In the circled area the vast majority of cloud cover was low (< 10,000ft) with a few ice clouds at high altitude. "we all can evaluate whether a plane at the height MH370 was suspected to be flying at could have left distrails in the particular clouds where the linear, and more materially, the directionally oriented disturbance can be seen." That would require MH370 to be intentionally flying in or above these linear cloud features – I consider that as such a remote possibility as to be impossible. "I presume, however, that the cloud top height would be highly material to determining whether this is an MH370 distrail. Am I correct in that assumption?" "Why did you pick the 6,000 foot elevation and lower set of clouds, not the 35,000 foot elevation, in making this argument." 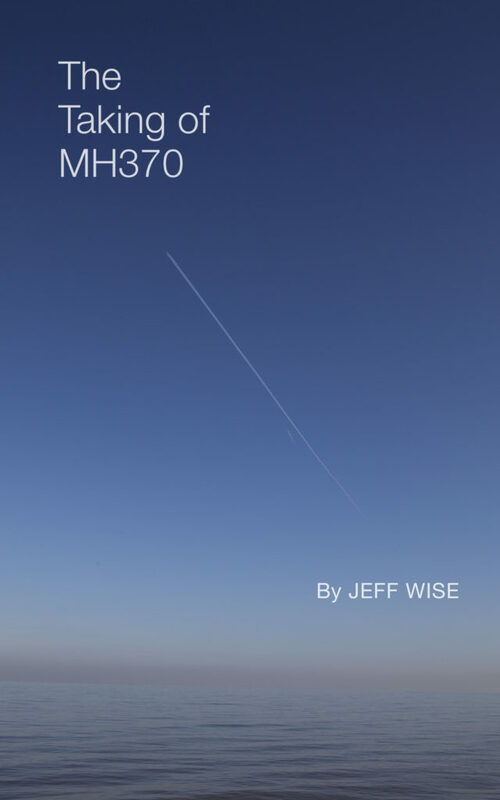 Because the high altitude clouds were very narrow and were not oriented in the same direction as MH370 (according to Dr Ulich) was believed to be travelling. As I say above, this would require MH370 to be purposefully flying in/above these clouds. "Are there details of the clouds you are referencing that you could describe in detail and/or post by photo link, or other link, to illustrate?" Unfortunately not, this data is from a commercial satellite. There is a MODIS pass at around the same time, its CTH product (MYD07 I think) may help, although the resolution is poor. "Mr. Proud, I presume your “40 minutes after the aircraft last communicated” comment means that the photos labeled as taken at midnight, and 00:30, were not as objectionable as the last taken, for some reason, but that the photo labeled as taken at 01:00, roughly 41 minutes after the last 00:19 handshake /“partial Ping” for some reason makes a distrail less likely to be shown in the photo." The whole lot of them are objectionable, the 01z image just highlights the absurdity of it: The changing sun angle should cause substantial movement in the 'contrail shadow' but this doesn't happen. "If you are suggesting these measures, I wondered whether you already know the answers." I suspect the answer based on a quick examination of the earlier images (both from GOMS and other sensors), but do not have time to do a robust analysis. The singapore area is covered by ADS-B, so I have some data there which is not licensed. Email me and I'll send it to you. Unfortunately, I can’t do the calculations, but it would be interesting to know. EK343 took off at 17:29 from Kuala Lumpur. MH370 was at IGARI at 17:19. The Vietnamese stated several times that MH370 passed IGARI. They saw it at BITOD (see Factual Report). I read that the supposed flight route back over Malaysia was not an entirely straight course, which suggested that the plane was flown manually. Pilots say it is impossible to fly a plane manually at high altitudes. Hence, if the plane was flown manually, it travelled at a lower altitude, and this corresponds to a slower speed. Is it even possible that the two planes would have been in close proximity at 18:25? Or was there only EK343? Would spoofing a southern route be possible from a plane flying from east to west? @DL: We have to be careful about what we mean by flying manually. For instance, the plane might have been automatically maintaining speed, altitude, and heading yet the setting for the heading was manually dialed in rather than flying a waypoint route using LNAV. If somebody has a time versus position data for EK343, I could compare its path with MH370. The normal flighttime KL to Dubai is about 6h20′. On 7th/8th March 2014 it was 6h50′? 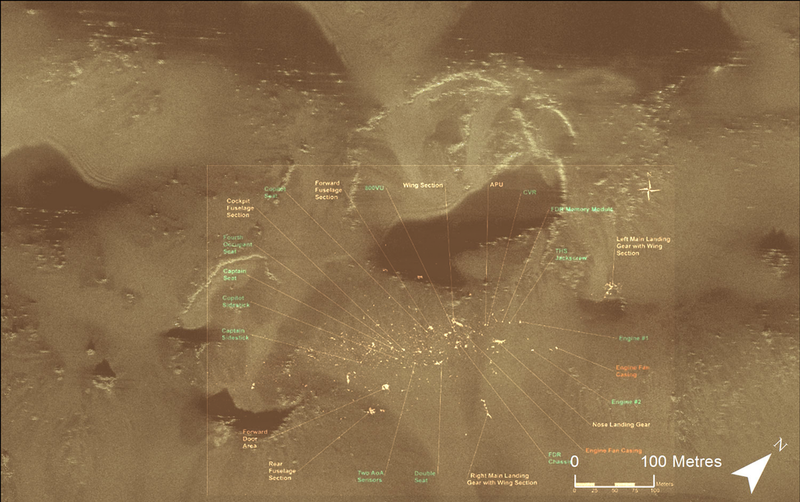 I have overlaid Lido image, digitized ATSB and Bobby’s image, but so far I did not find anything worth of mentioning. The length of the ‘hook’ is 168 km if I digitized visible ‘feature’ and calculated the distance correctly. As expected, no contrail associated with EK343, but it was slightly behind MH370, and thus, I presume, the pilots of EK343 were able to see MH370 on their weather radar. Where else have we seen a similar conclusion about ALTITUDE DATA? Now, let’s just pause and think about what you said — “no altitude information available from any source, official or otherwise, after the reported 32,800 feet at 17:39:59, just past Kota Bahru” — in light of what Bradsher (very clearly) reported. 1. Rolls Royce’s data as it pertains MH370’s ALTITUDE ‘doesn’t make sense’. “Interestingly, the Factual Information document indicates altitude and speed fluctuations for at least a 9-minute period around Kota Bharu- but no further mention of altitude after that. However, after cross-checking many early reports dating back to March 11, I believe that altitude reported in that NYT article was mistakenly attributed to that location. Orion — your read may be prove to be more insightful than you realize. Consequently, I brought Paul Howard into the conversation — because if understanding the RADAR data is ALSO critical to locating MH370 — then why not talk to someone with relevant domain expertise (read: who actually monitored airplanes on radar for a living) — aka a RADAR EXPERT? I think that you’ll find Paul’s new post on this — and the conversation that ensued — very interesting. Are you sure that the Factual Report states that Vietnamese radar saw MH370 at BITOD? Alternatively, of course, they could come clean about what REALLY happened to MH370. …maintain until all plastics have “waterlogged and sunk”. This may help you ? This was posted on Reddit….. It could help answer you questions. I am wondering if the image really qualifies as “proof”. Isn’t there a radar visualization mode showing you only unidentified blips ? This would explain the image. Alternatively, the identified targets (such as EK343) could have been removed with Photoshop for presentation purposes. So many questions and so few official answers. The smaller starfish shown there take up ~30×30 pixels, which is about the minimum you need to be able to identify something as a starfish. If 1 pixel = 70 cm, then Fugro has found starfish >20m (!!) in size. And I am not even including the fact here, that the imagery I linked to above is underwater photography. Sonar imagery is obviously of much lower quality than photography imagery, so you need a lot more pixels (than with photography) to be able to identify something. Maybe “rocks and starfish” was not to be taken literally. Maybe what they meant was just “regular seafloor imagery”. OR – what I rather believe – is that when they found a promising spot on their sonar images, they verified the location using a camera to get optical images. Mr Paul Kennedy stared at his sonar on March 7 in disbelief: He saw what looked like a debris field on the floor of the Indian Ocean. It’s Flight 370, he thought […] A camera was raced down to confirm that the aircraft’s wreckage had been found. Satellite Internet on the search vessels was cut off to prevent the news from leaking. “We thought, ‘We might have solved this,’” Mr Kennedy, a deputy managing director at search operators Fugro NV, said in an interview. “It was the right size, the right shape.” The cameras brought back the truth: No wreckage, just volcanic boulders and starfish crawling over a silty sea floor. So, no. That does not “reveal a lot more resolution than we currently believe”. BTW: Are starfish really supposed to show up on sonar imagery ?? I don’t think so, and would concur with Dave Reed. The Germanwings engines came apart (see picture: imgur.com/UU402mM.jpg), so how can it be guaranteed the MH370 engines remained in 1 piece ? By the way, given Brock’s quoted resolution of 1 pixel = 70 cm, the person in the picture would be smaller than 1×3 pixels and the engine part would be 1 pixel. And even Dave’s quoted resolution of 1 pixel = 10 cm would display this engine part as 9×9 pixels. Again, we are not talking photography imagery pixels, but sonar imagery with lesser quality. Would this be enough to find this engine part on the seafloor ? I really would love to see some sample images of the search devices currently in use. Peter – if they are in the practice of deploying camera’s to verify possible wreckage then we can relax I guess. They are properly equipped to investigate leads. Brock – that would be interesting to say the least, but anything they deliberately sink these days has to be decontaminated. And, they don’t want to introduce doubt over the data at this stage. You might struggle to get official backing but if it was done somehow there would be official curiosity in the findings. Crowd source? I’d like to independently estimate the probability of actually identifying debris, GIVEN that the Fugro towfish passes directly over it. – size of typical wreckage elements (engine/landing gear/?): ? – pixels per wreckage element required for positive identification: ? Do we have a sonar expert here ? For (1)+(3) unfortunately I don’t think there are easy, clear-cut answers. I don’t think that you could find a single piece of debris, probably not even an engine, if it was just laying there completely alone, especially on rocky seafloor. I believe, rather than a single piece of debris, you would spot the ENTIRE debris field by way of the unusual pattern all those pieces together form on the ground (i.e. a different pattern than created by the naturally occurring rocks in the surrounding). Again, it’s the debris field in its entirety, that allowed a positive identification, I think. I don’t think that at this low resolution you could identify a single, isolated object especially on rocky seafloor. I rather think it’s the combined mass of objects lying there together. In the last link, they even try to connect Kuda Huvadhoo to their claimed crash location. Obviously they use cameras if they think they have found something. They cannot use divers. What else should they do ? This does not tell us anything about the sonar image quality. Peter – AS long as they know what they are looking at I for one am relaxed. I have seen some images though a little while back and I can’t remember where. They did present some examples of shipping containers on the bottom. I suppose the same applies for MH370 detecting other traffic? VictorI: My assumption is that if MH370 had a TCAS II system in standby mode, it would be able to detect the presence of other aircraft transmitting ADS-B data via their transponders, but since it was not transmitting ADS-B data nor responding to interrogations, the TCAS of other aircraft would not detect it. Perhaps others more knowledgeable than me could correct me if that is wrong. “Some have raised the statement that TCAS doesn’t work if the transponder is disabled… this is only partially correct. Other planes TCAS would NOT see MH370 at all. MH370 would not actively query other planes as its transponder is off HOWEVER it could still listen to any transponder output from other planes that are actively transmitting [including the tandem plane]. Obviously they know what they are looking at, IF they lower a camera down there. IMO that is beside the point. IMO the point is, are the sonar images of good enough quality that it is 100% certain, that they could not miss the right location (where they would then verify with their cameras). I saw these too. Are there others? Because a huge cuboid is much easier to spot (due to size and form) than pieces of debris in between rocks. … because if it’s not 100%, then we are not sure if they have missed MH370 during the past months. Peter – from what I can gather there has been plenty to follow up on. Numerous “hard objects” of various size have been investigated for no result. If there are serious reservations about the equipment they are keeping it close. The container images were not that great as I recall. It’s good to bring together lingering information and to make connections between them to get a bigger picture. The weekly update is in: further hints that winter will JUST BARELY beat the SSWG’s spiffy new analysis to the SIO. It makes me ill to see these people continue to spin their yarns, accountability-free. Yes – indeed would be interesting. As far as i can see there are already some guys/gals with the right skills on the way – at least Phil (Thank You! Briliiant) and on reddit. I think we will see more soon. How to spoof – IDK. Question for the experts. But I still think it is somehow important – and remember, EK343 is Emirates and the CEO is Tim Clarc, who got a lot media attention for his critiques and his well articulated assumptions. I haven’t been able to convert the raw Electro-L data myself yet. If you have it, would it be possible to share the high-res. 0100 UTC image (including the Perth area) in tiff/pbm/bmp or alike format? “Alternatively, the identified targets (such as EK343) could have been removed with Photoshop for presentation purposes.”. In my opinion the “Lido image” is an overlay of a background image with the “blip data” from two (or more) radars. Military radars do not typically show waypoints, civil routes etc – this has been discussed many times. Yes, it is possible to track on display a target aircraft only, not only unidentified aircrafts. No need to use Photoshop to remove something. There is no proof that the image was faked, but there are many questions how it was composed, and why Malaysian authorities refuse to release digital data in the form (time, lon, lat, alt). I personally don’t ascribe to the theory that the Lido image is deliberately faked, but for those entertaining that concept- wouldn’t it be more likely to be a case of mistaken identity instead? The path through restricted air space prior to N571 would tend to rule out a commercial flight, however, what are the chances another plane was fleeing (or scrambling) from Penang as MH370 approached? To reiterate, Victor and others have pointed out that the BFO from 18:25-18:28 seems to confirm the bearing at the end of the trace, and the encroachment through Indo airspace is troubling, so this idea still may be far-fetched. However, in the spirit of going back through everything with a fine-tooth comb, I applaud the current efforts underway to find alternative paths which match the data. Thanks everybody for the links and replies to my questions. Much appreciated. BTO (18:25:34.461) = 51700 microseconds? In other words, if the restart of AES occurred at 18:25:27 and 4600 microseconds is implied delay due to inherent hardware/software behavior upon restart, why the next BTO sample is much larger? One would expect it to be either ‘regular’ (approximately 12520), or ‘regular’ + 4600 (approximately 17120) at 18:25:34, right? This gives a reason to suspect that these BTOs and BFOs are correct, just we don’t know how to interpret them. Perhaps BFO compensation terms were not properly computed in both cases. Victor, I guess you assumed 273 Hz as a regular BFO value, right? I’m asking this in connection with 0.7g ascent [Posted April 26, 2015 at 11:59 AM]. Brock – call me petty but why did they stop announcing the search progress as a percentage once they passed 60%. It must be very close to completed but all the focus is on the coming season of towing – why? All eyes have moved forward six months while they are still towing! Now my impoverished mathematical brain suggests to me that the remaining area to be covered this season is the most “likely” place it will be? More questions regarding distrails and cloud elevations, all in hope of further evaluating whether the three photographs posted by Dr. Ulich show a trail left by MH 370 ending roughly where the jet fell from high altitude. Mr. Proud, your emphasis on 6,000 feet puzzled me. Another publication on dissipation trails that I found explained: “ . . . dissipation trails can form in several ways. Jet engine exhaust is not only moist, but also hot, and this heat tends to dry the atmosphere. If the ratio of added heat to added moisture is large enough, an aircraft flying through a cirriform cloud can evaporate the cloud in its path … Aircraft motion can also produce short-lived distrails by the turbulent mixing of dry air just above a thin cloud layer… Finally, aircraft flying through supercooled clouds can initiate glaciation of the cloud (and the production of ice crystals) along its path, and the resulting ice particles grow rapidly and fall out, leaving a distrail. It seems that determining the elevation of the clouds in the images, and the elevation of MH370, and finding they are consistent, are key inquiries. In response to my last post asking whether distrails would negate the critiques of the SIO images, Mr. Proud answered: “For the GOMS (Geostationary Operational Meteorological Satellite) images there’s no way to tell unless the altitude of MH370 is known. If it were at a typical cruising altitude then long distrails were not possible, no. I confess, I did not understand the conclusion, or any logic leading to this “no way to tell/not possible” set of conclusions, but believe that these issues must to be addressed to be able to determine if the three images show a distrail reliably enough that it the site is worth investigating. Mr. Proud, I also do not understand what you meant by “If it were at a typical cruising altitude then long distrails were not possible, no.” Are you suggesting that a jet at 35,000 feet could not make a distrail in a cloud at 6,000 feet. If you are, I think you are creating a straw man with no foundation. If you meant something else, I hope you can explain. I don’t like feeling unable to understand these posts, but hope that by asking, I give you an opportunity to clearly educate the many people interested. Mr. Proud recently and courteously wrote: “The closest sat overpass (a couple of hours later) shows Cloud top heights in the region were around 6,000ft. Some linear cloud formations were visible with altitudes up to 35,000ft within 100km of your theorized location.” Mr. Proud also recently wrote: “ . . . In the circled area the vast majority of cloud cover was low (< 10,000ft) with a few ice clouds at high altitude. I am an attorney, who routinely cites governing authority and evidence in writings for the court, but have never, in 20 years practice, dealt with data from commercial satellites as an information source. I presume the familiar laws of the United States that I know apply to what you can or can not publish, but I could be wrong. I presume that if the commercial satellite data/images are copyrighted, that you could republish them as a non profit, educational “fair use” – but if I am wrong, perhaps you might explain. I presume that if some type of confidentiality agreement is involved in some type of licensing, that you might at least identify the parties to it and the date, time, and source of the information without revealing anything confidential. (But then, I see no reason for a satellite photos of cloud formations a year ago should be confidential. ) If you believe you are not free to publish the commercial satellite data/images, perhaps you could explain the sanction you fear you might receive. It would not be as extreme as criminal prosecution for treason, I am sure, but a lesser punishment might still compel your reasonable compliance. Is is a civil liability you are mindful of, perhaps? A revocation of license? Something else? Kindly explain. I think that in the two intended circles, I see some towering vertical clouds, likely cumulonimbus, (I believe you call them ice clouds) rising to a likely altitude of 35,000 to 41,000 feet, which are not dissipating, and that I also see some lower clouds, perhaps altocumulus or cirrocumulus from their patchy patterns, which are clearly dissipating between the first (left) and last (right) image on Page 7. They are visible in greater numbers outside of the red circles, and if they were in the red circles, seem to have dissipated at the bottom 4/5 of the right circle to leave the view of the dark sea below. I hope you understand that identifying the particulars could really help the analysis. The devil is in the details, and your training seems far more extensive than that of most adults. Providing details of what is in the circle, via your best information if possible (rather than the MODIS pass /CTH product /(MYD07?) that you faulted for poor resolution) could be “huge.”. That said, are you free to publish a link to the pertinent poor resolution images from the MODIS pass /CTH product /(MYD07?).? The subject fascinates me, and any objective information /data you could publish by link to the source would help. Can you please explain why it matters if high altitude clouds are oriented in the same direction a plane is travelling? To my mind, I can’t see that orientation matters at all to distrail formation. I believed that I saw a distrail precisely because it is going “across the grain” through what I believe are high altitude ice clouds. And I also believe that the literature clearly describes the formation of distrails in high altitude ice clouds. As far as the circled high altitude clouds being, in your words, “very narrow”, I don’t know that I agree with the characterization, but also do not see how narrowness matters. For example, I think I see a narrow, high altitude ice cloud, twisted by the distrail, in the middle of the dissipating area at the circled image on the right of page seven. I think a cloud of that shape was there, and a plane flew near enough to twist it as shown. I’m not trained at all at this. Can you elaborate at why the narrowness of a cloud feature oriented in a different direction from a jet’s travel makes a distrail less or more likely? My own belief is that the photos do not show a shadow, but rather show the darker sea through a crack in the clouds that the plane created. (An intentional Clash reference that I hope Duncan Steel will enjoy.) So I do not believe that movement of the sun with respect to the place a shadow of a contrail would fall on a cloud below matters at all. I don’t know enough to suggest Dr. Ulich was wrong to think he saw a shadow below a contrail or two, and am sure his intelligence exceeds my own. However, I do think some type of trail of the plane is there, and that it if it is a gap in the clouds, that the movement of shadows through the three photos should not be part of what to expect. Beyond asserting, in reaponse to Dr. Ulich’s shadow proposal, that “the changing sun angle should cause substantial movement in the 'contrail shadow' but this doesn't happen” do you have any reasons to find the photos objectionable as proposed depictions of distrails? Do you agree? I assumed you did not, based on reading: “The plane’s exhaust heat is actually not even bright (much less brilliant) in the thermal infrared because the optical thickness of the exhaust plume is quite low. So the exhaust gas may be hot but that alone won’t produce a significant or lasting IR signature.” However, I don’t understand the science here. If Mr. Proud makes good points here, I wondered, are you intending, if time allows, to publish further on such subjects and address them thoroughly? And Dr. Ulich, I presumed that your publication regarding contrail images was “rushed” in order to possibly be reviewed in the somewhat crucial MH370 THIRD TRIPARTITE MINISTERIAL MEETING of 16 April 2015, meaning your publication date. Was it rushed for this reason, and/or possibly others? Are you planning to publish an amended Addendum 4, with greater accuracy added/errors removed? Are all the numerous squiggly lines in picture (all of which seem wider than the purported FMT contrail line) possibly Cirrus fibratus clouds? If not, what are they likely to be? BTO timing: following a few online conversations concerning understanding/otherwise of the the BTO (and BFO) measurements I went back to the AMS(R)S spec and reviewed the encoding and framing process. The issue of the BTO for the GES received Log On Request (requiring ‘correction’ of 4600us) and the subsequent Log On Acknowledge is certainly associated with the a) channel frame timing and b) the switch from the P-R Station Management Channels used by the AES to execute Log On and the allocated P-R Data channels. I’ve attempted a number times to follow the above with a succinct but ad-hoc explanation but I’ve found it pretty much fruitless without some illustrations. I remain confident that the BTO measurement is credible. The key to the BTO differences/exceptions during the GES Log On exchanges is the frame timing of the P/smc and R/smc channels vs the allocated, full rate, P/d and R/d channels. As Orion states above, it’s a worthwhile exercise to review what one accepts as ‘fact’. I don’t have much time to spare at the moment but will attempt to draft a more complete explanation over the coming days. I was actually going through the same issue, looking critical to BTO values as well these days. As it is described in the JoN article the 4600 us correction looks pretty ad-hoc, given the fact that we are not sure that there was a power-up cycle going on. B possibly supports a more Northern route; in one of the scenario’s (based on the 18:25 data point ) I would call this the “Tiger” route, with possible end points from roughly NW China to across Java in the SE (based on the 00:19 data point). I hope the 4600 us can be really well substantiated (including showing the historic data on which it would have been based). Only then option B can be discarded. Re: “The subsequent messages during the logon sequence were found to have unreliable delay”. – In my understanding there were no such large delays (exceeding 40000 microseconds) recorded at around 16:00. Either ‘regular’ or ‘regular’+4600 microseconds. – No BTO available after 00:19:37.443. – Both abnormal BTO values are of similar magnitude: 51700 and 49660 microseconds. Was it really ‘unreliable’ delay (in stochastic sense), or a result of abnormal, but predictable, hardware/software behavior? If the latter, how can we make sure that respective BFO values of 243 Hz and -2 Hz were not affected due to the correction term? – It appears that BFO of -2 Hz can be quite reasonable value if the correction term is set to zero. Airspeed has to be smaller (subject to heading), but sufficient to keep the aircraft in the air, without steep dive. – As Victor has shown, BFO of 243 Hz does have a significant impact on the maneuver 18:25-18:27. However, it is not ‘consistent’ with anything: previous heading, subsequent BFOs, logic, Bobby’s contrail, etc. As long as both abnormal BFOs are associated with abnormal BTOs, perhaps these two BFO values have to be also adjusted. @Niels, maybe the datasets A and B are from different/multiple flights that are unrelated ? I only included the 3 VNIR bands. That’s the 04:00 image, which if I’ve converted MST to UTC correctly, should be the 01:00 UTC image. Would a phugoid motion result in higher speeds in the troughs and lower speeds at the peaks? I don’t have time to read huge amounts of text. Could you summarise in a few short questions? @Matty: if we know everything search leaders know about MH370’s fate (i.e. if the “indicative” search area expansion accurately describes where they truly think the plane lies), then yes: each pass is statistically less likely than the last to turn up anything. And yes: that puts any shift in focus to next season somewhere on the [prematuresuspicious] spectrum, depending on where you’re at re: trust in the search leadership. And you know where I’m at re: trust in search leadership. Your post asks many relevant and important questions. I shall respond to some of those addressed to me below and to the remainder in the near future. With regard to the cloud altitudes along the route, I, too, was a bit confused by Mr. Proud’s description and a lack of any original source material for verification. Hopefully he can clear this up. You are correct that my goal in putting out the contrail/distrail report on Apil 16th (coincident with the minister’s meeting), was to have something available, even if rough and incomplete, that would stimulate a closer look and a continued search program. It is very unfortunate that whatever contrail work was done earlier, and paid for, has never been made public. Negative searches for relevant information can have considerable value, and I don’t understand why those results have never been made public (at least as of today). I have accomplished my intention of focusing attention on the possibility of contrails/distrails. It remains to be seen whether the features Kirill Prostyakov and I have called contrails actually turn out to be caused by MH-370. My current view is that one can make arguments for and against it. Some of their observed characteristics are consistent with expectations, and some, at least at first glance, are not. It is quite possible that the most convincing argument for or against our conjecture will be the location of 9M-MRO when it is found. It is possible the SIO dark lines are not contrail shadows or distrails, but, if they are not, then their accurate alignment woukld indicate a very low probability if by chance. It is also possible that the feature(s) we called a FMT contrail are actually due to multiple effects. The arc portion of the proposed FMT contrail is visible in both MWIR and LWIR. The contrast is very low (on the order of 0.1%) and roughly equal in both bands. The linear features behave somewhat differently, indicating to me at least the possibility of a different causation. My work on this possibility is continuing. I have not yet looked at the SIO images in the thermal IR bands. I hope to do that in the near future. They may help us understand the fetaures and if they could have been caused by a passing aircraft. Do not interpret my comments about the invisibility of the hot gas exhaust alone as implying anything about distrails. I was simply pointing out that the emission of the exhaust plume is very weak and would not be seen from space by itself. Condensation or dissipation of clouds is required to be seen. There were optically thin clouds in the FMT area when MH370 passed through. They are visible in the infrared nighttime images and also in the visible images after daybreak. I do not know the cloud type nor the altitude. One has to be careful in assessing cloud types in the spatially-bandpass-filtered images because they eliminate all the low-spatial-frequency content. The classification is probably best done in the unfiltered raw images. Yes, I will produce a revised report with corrections and additions once the analysis of all the possible contrail features is complete. I didn’t understand any of that, could you please clarify? We don’t know the probability distribution of the location of the aircraft across the search area, and the search is probably not even going from high to low probability within the 60000sq.km. original area – the logistical needs of the ships seem to be just as important in ordering the search across that area. So how can you say “each pass is statistically less likely than the last to turn up anything”? As I see the data from GDAS1 show nearly eastern wind of 10 m/s at 14 km altitude in the beginning of your ‘hook’. Thus if the hook is a feature associated with an aircraft (MH370 or any other) and the direction was CCW as indicated by blue arrows in your report, the real shape of the ‘hook’ would be slightly stretched in the longitudinal direction. Some days ago I asked whether the ‘hook’ could be traces of smog rather than a usual contrail. As long as there were no comments, I googled a bit on this topic. Outcome is interesting. “Various nylons break down in fire and form hazardous smoke, and toxic fumes or ash, typically containing hydrogen cyanide”. I think there might be many other products of fire that have spikes in their spectrum around 3.5 micron wavelengths. I hope astronomers and specialists in remote sensing can comment more on this possibility.